Larry J. Sabato's Crystal Ball » What Fuels Presidential Approval? With gas prices soaring as summer vacations near, many optimistic Republicans and nervous Democrats are left wondering about what impact those prices will have on President Obama’s reelection chances. High gas prices, they point out, sank Jimmy Carter in 1980 and added to the baggage George W. Bush passed on to Republican nominee John McCain in 2008. A Washington Post-ABC News poll this week showed that 70% of respondents felt high gas prices were causing them financial hardship. Fewer than one in four Americans who say gas prices are a “serious” financial hardship approve of Obama’s job performance and 60% of Independents facing financial hardship from rising gas prices said they will not vote for Obama in 2012. Even Obama’s advisers see cause for concern as the price at the pump surges. Last weekend, the president’s radio and Internet address centered squarely on gas prices, as he warned that there was no “silver bullet” to bring prices down, but simultaneously unveiled a coalition of federal agencies to investigate potential fraud within the markets in hopes of relieving some of the pressure pushing prices upward. Skeptics of the idea of a correlation between gas prices and presidential approval ratings wonder if these anecdotes are making meaning out of mere coincidence. After a temporary boost following the 9/11 terrorist attacks, George Bush’s approval ratings fell over the next several years, just as gas prices rose rapidly, but at that time Alan Abramowitz ably rebutted the claim that the ratings drop was a result of higher pump prices. Similarly, weekly approval numbers from earlier in Obama’s term seem to bear little relation to the gas prices at the time of those polls. The full story, as is often the case, is not entirely black and white. Comparing average monthly “real” gas prices (that is, controlling for inflation) to Gallup Poll data for presidential approval over the past six presidencies unveils some clear trends and helps explain the factors at work. The graph below charts presidential approval rate (in blue, with units shown on the left y-axis) and real gas prices (in green and on the right y-axis) over time, from Jimmy Carter’s inauguration in 1977 to the most recent data available in March 2011. The gas price data (provided by the federal Energy Information Administration) is presented “upside-down,” with higher prices shown lower on the y-axis to better demonstrate the potential correlation with approval ratings. From this birds-eye view, it seems that there is some level of correlation between the two sets of data, especially during the Carter, George W. Bush and Obama presidencies. As gas prices rise (move towards the bottom of the graph), approval ratings fall (also move downwards). To truly test the level of correlation, we can look at a scatterplot of the data, comparing gas prices (in real, inflation-adjusted numbers) and presidential approval ratings. 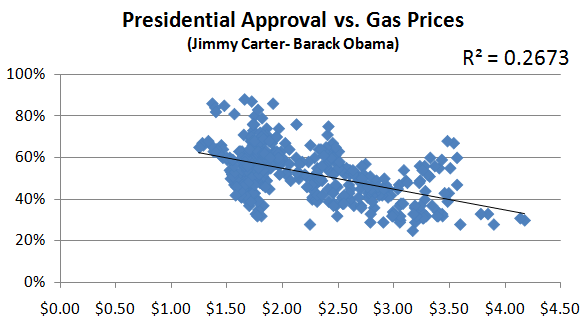 The correlation between presidential approval rating and gas prices is -.52, which is strong but not overwhelming. Similarly the r-squared value of the correlation is a significant, but small, 0.27 on the scale of 0 to 1. While far from being a perfect fit (where r-squared would equal 1), there is clearly some relationship between gas prices and approval ratings. Looking at just this chart and the correlation between the two variables, it is clear that gas prices and approval ratings are related, but are not perfect reflections of each other. Note, however, that this strong correlation should not be taken to imply that high gas prices necessarily lead to lower approval ratings. It is possible that, for example, some third factor is causing them both to move, perhaps due to some economic event or geopolitical circumstance. It may also be useful to note that most of the “noise” which appears on this scatterplot (that is, outliers that lie fairly far from the overall trendline and reduce our measures of correlation) falls into two simple categories. First, there are a number of unusually high approval ratings for presidents when gas was roughly $3.50 per gallon. Actually, it is only unusually high approval ratings for one president, since when gas cost $3.25 or greater (in today’s dollars), only Ronald Reagan received a monthly approval rating higher than 55% and all seven instances were in his first year as president, 1981. 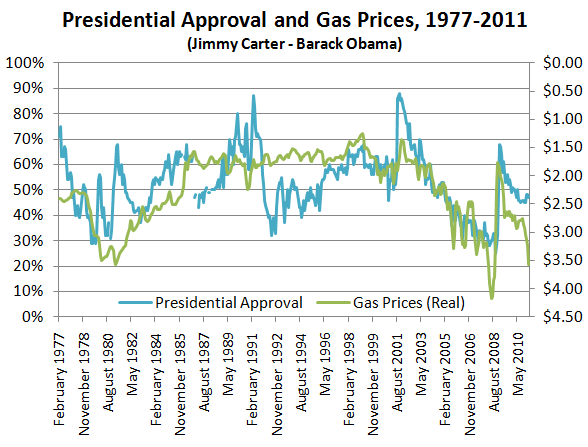 One possible explanation for the severed tie between gas prices and approval ratings in this brief time period is that voters still blamed the previous president, Jimmy Carter, for the high gas prices and were willing to give Reagan the benefit of the doubt for a few months before placing the blame in his lap. The second factor limiting the correlation between gas prices and approval ratings are that when gas prices are low, they have almost no bearing on voters’ view of the president. This can be easily seen on the left side of the scatterplot above. While on the right side, the points seem to somewhat follow the trendline, on the left the presidential approval rating varies all the way from 90% down to 30%. This observation leads to a simple theory that makes some intuitive sense. While the president is punished in the court of public opinion whenever gas is expensive, he receives no reward for presiding over times of cheap gas. 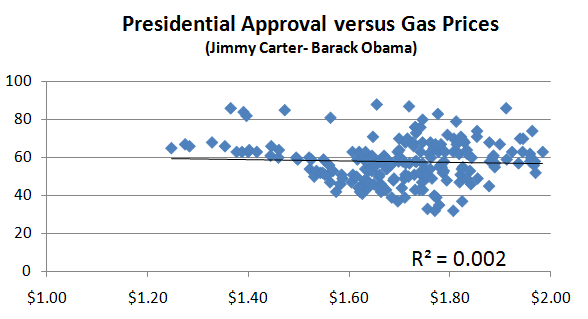 The scatterplot below shows the relationship between presidential approval rating and gas prices, but unlike the graph above only includes data points where a gallon of gas was selling for under $2. The correlation is -.045 and the r-squared value is 0.002, both almost a perfect 0, indicating no correlation at all between the gas prices and presidential approval when gas is cheap. Taking all of the data into account splashes a bit of cold water on both ideological camps. On the one hand, it is clearly true that high gas prices often coincide with lower presidential approval ratings. As political scientists have long demonstrated, these approval ratings are a strong indicator of a president’s reelection chances. As we have seen, though, gas prices alone certainly are not a perfect predictor of approval ratings or, indirectly, reelection. While continually rising gas prices would likely weaken Obama’s reelection standing, it would be just one of many factors voters consider when evaluating his first term.